A former chairman of the BBC has questioned the even-handedness of Lord Hutton's damning report. 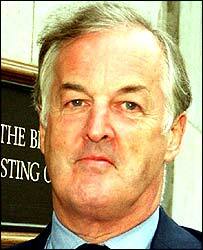 Sir Christopher Bland said while the BBC should accept it made mistakes, it was legitimate to ask if the law lord's treatment had been balanced. "It seems to me that he white-washed the government and maybe he was right to do that," said Sir Christopher. "But he tarred and feathered the BBC and there just seems to be... a real imbalance in his treatment." Sir Christopher, who was BBC chairman between 1996 and 2001, said there was a "real danger" the BBC could be cowed by the report. But he did not believe the number of "bodies on the lawn" - BBC people tendering their resignation - was necessarily the right reaction to criticism by Lord Hutton. "I think what the BBC needs is a time for reflection, a time to think in detail about the implications of the Hutton report and to take the appropriate actions to remedy those difficulties he rightly flagged," Sir Christopher told BBC Radio 4's Today programme. Sir Christopher's successor, Gavyn Davies, resigned on Wednesday after the most serious claims in defence correspondent Andrew Gilligan's BBC's reports were branded "unfounded". Lord Hutton cleared the government of "sexing up" its Iraq weapons dossier with unreliable intelligence, but he criticised "defective" BBC editorial controls over Gilligan's broadcasts on the Today programme. Asked if those responsible for the corporation's problems should be made to carry the can, Sir Christopher said: "It depends if you think success should be measured by the number of scalps hanging from Alastair Campbell's belt - I don't think that's the right measure." The former chairman was referring to ex-Downing Street spin doctor Mr Campbell who was cleared by Lord Hutton of claims he had inserted the dossier on Iraq with the 45-minute claim. Sir Christopher said the BBC had "lost an extremely good man" in Gavyn Davies and warned that it "shouldn't lose" its director general Greg Dyke or director of news Richard Sambrook. "I don't think that is appropriate now. There were mistakes made and they should be corrected, but the idea that there is a systemic failure that requires mass execution at the BBC is just wrong." He conceded the BBC had not been quick enough to correct the mistakes it had made, but insisted "that is different from saying the whole of the BBC is flawed". But Sir Christopher said it was "legitimate to question" whether Lord Hutton was "even-handed" in his treatment of politicians, civil servants and the security services with the standards of conduct he applied to journalists and broadcasters. "There just seems to be, if you read the report carefully, a real imbalance in his treatment, and that, after all, is why the BBC is in the state it is today," he said. "It's not because the criticisms were unexpected, it's because there were no balancing criticisms of the government." "The BBC needs a time for reflection"